Our Home Family Resource Center kicked off Empty Bowls Mercer County with “Create A Bowl” events at Brew Nation/Potters House on Main on January 19th and 26th. Our Goal for this event was to paint 220 bowls for the Empty Bowls Dinner & Auction on March 30th and to raise at least $3000 – both goals were met! This event’s success is due in large part to the hospitality and support from Brew Nation/Potters House and the participants who join us to paint bowls and raise funds for Our Home. We cannot begin to express our appreciation for the individual painters who collected donations from their friends, family members, and neighbors and volunteered two hours of their time to help us paint the bowls we need for Empty Bowls Dinner & Auction. A minimum $20 donation was required to participate in “Create A Bowl”. This fee was set to cover the cost for bowls, paints, firing, and space at Brew Nation/Potters House. There were 17 painters who raised at least $50 in donations, and they were entered into a participation raffle. 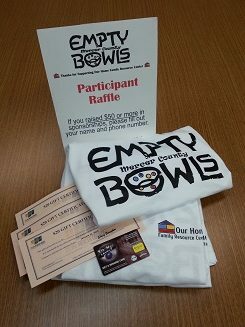 Raffle winners include: Ed Hosbach (gift card to Pla-Mor Lanes); Gina Bruns, Carol Hone and Ann Boyer (Celina-Mercer Chamber of Commerce gift certificates); and Ella Shelby, Debra Dunn, Callie Colson, Angie Sudhoff, Dan Gabriel, and Kay Klopfleisch (Empty Bowls Mercer County event t-shirts). The bowls created at this event will be gifts for the guests at Our Home’s Empty Bowls Dinner & Auction on Saturday, March 30th, at American Legion Post #210 in Celina. Tickets for the dinner are on sale now. A $25 ticket includes personal selection of a souvenir bowl and a buffet of savory soups donated by local restaurants, salad, and soft drinks. There will be a cash bar available for those who prefer adult beverages. For an additional $10 dinner guests can reserve a specific souvenir bowl for the Dinner & Auction – this means that instead of picking-your-own-when-you-arrive from whichever bowls remain available; folks can request the bowl that was painted at “Create A Bowl” by their partner, child, friend, grandchild or colleague. Reserved and general admission tickets are available at Our Home, 117 W Fayette Street in Celina and general admission tickets are available at Chief Supermarkets in Celina and Coldwater. All proceeds from Empty Bowls Mercer County, both “Create A Bowl” and the Dinner and Auction, will be used to support and expand Our Home Family Resource Center’s programs and projects. You can visit www.ourhomefrc.com to learn more about Our Home’s work.